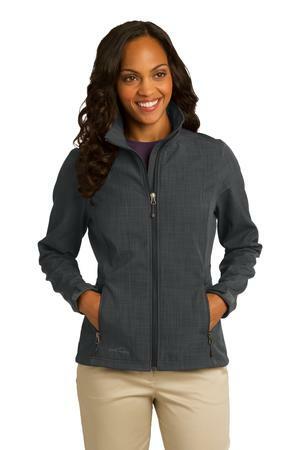 The Eddie Bauer Ladies Shaded Crosshatch Soft Shell Jacket Style EB533 is available in Ladies Sizes XS-4XL. It can be purchased in your choice of the following colors: Black, Blue, Grey and Purple. Gear up for the office or weekend adventure in this water-resistant, breathable soft shell that features a subtle crosshatch texture. This Ladies Shaded Crosshatch Soft Shell Jacket features 3000MM fabric waterproof rating, 3000G/M2 fabric breathability rating, reverse coil zippers, front zippered pockets, adjustable tab cuffs with hook and loop closures and an open hem. It also has princess seams and contrast Eddie Bauer logo embroidered on hem and is made of a 100% polyester woven shell bonded to a water-resistant laminated film insert and a 100% polyester fleece. Be the first to review “Eddie Bauer Ladies Shaded Crosshatch Soft Shell Jacket Style EB533” Click here to cancel reply.